On April 30, the Supreme Court heard oral argument in Limelight Networks v. Akamai Technologies, a case involving the thorny issue of “divided” patent infringement—specifically, whether a defendant may be held liable for inducing patent infringement under 35 U.S.C. § 271(b) even though no one has committed direct infringement under Section 271(a). The Court’s decision is likely to have important implications for developers of distributed systems and method innovations that are typically executed by multiple independent persons. For example, patents on Internet services and business methods may involve some steps of the patented method that are performed by the technology company and other steps performed by customers. Predicting the Winner: A Win for Akamai? In a prior post, I explained the method by which I am predicting the winners of the case based on counting up the number of questions during oral argument. The side that receives more questions from the Justices typically is on the losing end of the decision. Using that method, Akamai might get a slight edge to win the case. 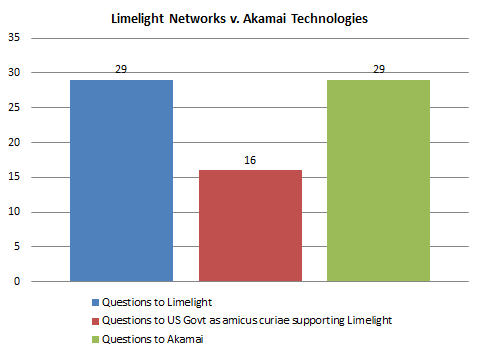 As depicted in Figures 1 and 2 below, 5 justices asked Limelight’s attorney more questions, and, when coupled with the questions to the U.S. government (as amicus curiae supporting Limelight’s side), the Justices asked 16 more questions to Limelight’s side, 45 questions to only 29 questions to Akamai. Those numbers suggest a win for Akamai based on this method. However, I am not too confident in this prediction. The Justices did in fact ask the same number of questions to both parties (29)—which suggests a closer call. As I’ve noted in the prior post, the presence of an attorney for a non-party (an amicus) may skew the numbers somewhat if the Justices feel obliged to ask every attorney some questions. Plus, the U.S. government’s position may confound the conventional analysis of the number of questions. In a different case just decided this week, Octane Fitness, LLC v. ICON Health & Fitness, Inc., the number of questions was quite similar to this case, but it defied the pattern described above. In Octane, there was an even split of questions between the parties (31), plus a differential of 51 questions for petitioner’s side (adding in the U.S. government as amicus curiae) to 31 questions for the respondent’s side. But the Supreme Court ultimately decided in favor of the petitioner, despite its side receiving the greater number of questions. The Octane case suggests that the questions in Limelight may defy the conventional pattern—which would bode well for Limelight. Today, the Supreme Court hears oral argument in Riley v. California. This case raises a complicated question about technology: Can the police search your cell phone upon arrest without a warrant? Below, Professor Kimberly Bailey discusses the background of the case and the issues at stake. In a prior post, I explained the method by which I am predicting the winners of the case based on counting up the number of questions during oral argument. The side that receives more questions from the Justices typically is on the losing end of the decision. Using that method, the petitioner Nautilus’s side (asking for reversal of the Federal Circuit’s decision) should prevail. 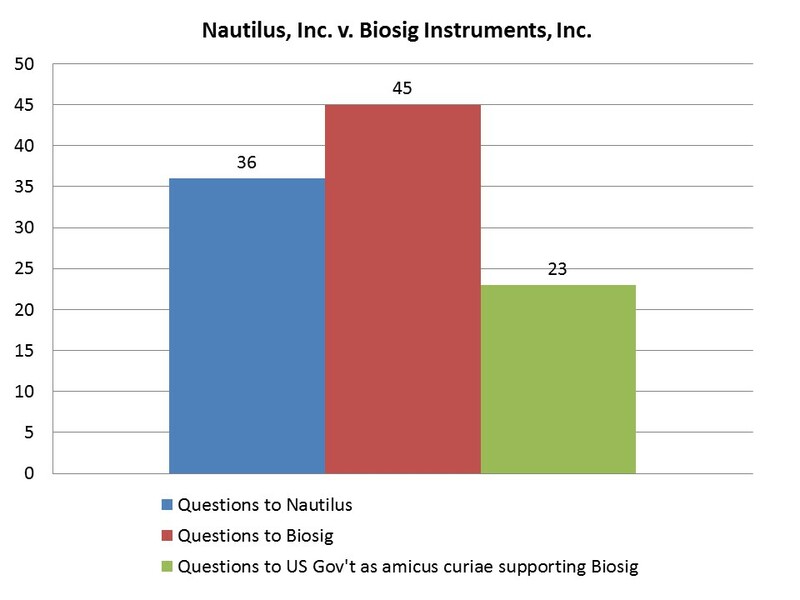 The Court asked nearly twice as many questions to the respondent Biosig’s side (including the U.S. government as amicus curiae supporting Biosig). The count was only 36 questions for Nautilus’s side to 68 questions for Biosig’s side. On April 28, 2014, the Supreme Court hears oral argument in Lane v. Franks. This case deals with the scope of free speech protection for public employees. In the video below, Sheldon Nahmod explains the background and issues at stake in the case. 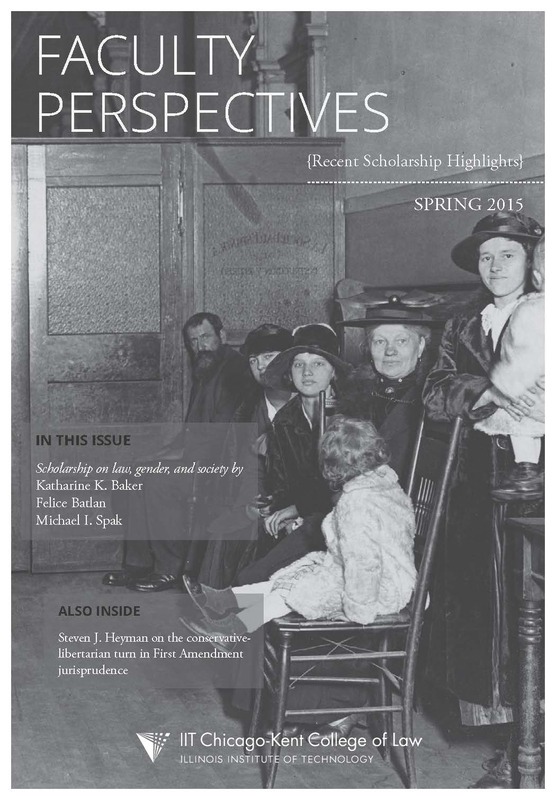 A roundup of faculty appearances in news sources and media from the last week, 4/17/14 to 4/24/14. 4/21 – Dan Tarlock was featured in a Fox 32 video and article on a lawsuit the Illinois Farmers Insurance Company is bringing against Chicago and Cook County for losses resulting from flooding last year (“City, county face lawsuit by Farmers Insurance for April 2013 flooding”). 4/22 – Vinay Harpalani appeared on HuffPost Live to discuss the U.S. Supreme Court’s recent decision regarding race-conscious admissions in Schuette v. Coalition to Defend Affirmative Action (“Affirmative Action: SCOTUS Upholds Michigan Ban”). 4/22 – In a video posted by ISCOTUSnow, Ed Lee unpacks the issues at stake in the U.S. Supreme Court case American Broadcasting Company, Inc. v. Aereo. On Tuesday, Professor Vinay Harpalani appeared on HuffPost Live to discuss the U.S. Supreme Court’s recent decision in Schuette v. Coalition to Defend Affirmative Action. The case originated in Michigan, where voters backed a proposition to amend the state’s constitution to ban affirmative action measures in public education and employment. In the 6-2 decision, the Court upheld the right of Michigan and other states to prohibit racial preferences as a factor in university admissions. On April 22, the Supreme Court heard oral argument in an important copyright case involving Aereo, an Internet TV service from Brooklyn that has the financial backing of media mogul Barry Diller. The case has received a lot of media attention because it pits a disruptive Internet startup against the old-line broadcast TV networks. But it also has the potential to transform the cable industry and the way in which people watch TV. Predicting the winner: A Win for Aereo? If you want to learn more about the facts and legal issue in the case, jump to the analysis below. Right now, I’m going to cut to the chase and predict a winner. Of course, every appellate attorney knows that predicting the outcome of a Supreme Court case based on how the oral went is perilous, if not foolhardy. But Judge Richard Posner and Professors Lee Epstein and William Landes have analyzed a simple—yet statistically significant—method of identifying the likely winner of a Supreme Court case based on the number of questions the lawyers receive during oral argument. In a nutshell, the party that receives the most questions from the Justices during oral argument is more likely to lose. See Lee Epstein, William M. Landes, & Richard A. Posner, Inferring the Winning Party in the Supreme Court from the Pattern of Questioning at Oral Argument, 39 J. Legal Stud. 433 (2010). Prior studies by others found similar results. Id. at 434 n.1 (citing Shullman, Wrightsman, and Johnson et al.). Even Chief Justice John Roberts arrived at the same conclusion based on his own study of 28 cases. Id. This post on United States v. Alvarez is part of ISCOTUS Director Chris Schmidt’s “Drama in the Court” series. Today the Supreme Court will hear oral arguments in Susan B. Anthony List v. Driehaus, a First Amendment challenge to an Ohio law that prohibits intentionally false statements about political candidates. The case itself presents the basic free speech question only obliquely. The central issue before the Court is a technical one: whether a party can even go to court to challenge this kind of law prior to being prosecuted for violating that law. This is a question, in other words, of whether the plaintiff has “standing” to make the First Amendment challenge. But the underlying constitutional question—whether the First Amendment permits the regulation of blatant lies in political campaigns—will surely be part of the tomorrow’s oral argument. The First Amendment status of lies is not a new issue for the Roberts Court. It was at issue before just two years ago in United States v. Alvarez, a case involving a small town public official who liked to tell stories about himself. In describing his background at a local water board meeting, Xavier Alvarez described himself as a retired marine who had won the Congressional Medal of Honor. This was a bald-faced lie. Alvarez had never even served in the military. It was, as the Court would describe it, “a pathetic attempt to gain respect that eluded him.” Alvarez was charged with violating the Stolen Valor Act of 2005, a federal law that prohibited falsely claiming military decorations or medals. Alvarez challenged the law as infringing his First Amendment right to free expression. The Supreme Court sided with Alvarez. Justice Kennedy, writing for a 6-3 majority (although his reasoning had only four votes), rejected the Justice Department’s contention that lies receive no protection under the First Amendment. As content-based speech restrictions, lies must be held to the most exacting demands of the First Amendment. “Some false statements are inevitable if there is to be an open and vigorous expression of views in public and private conversation, expression the First Amendment seeks to guarantee,” wrote Justice Kennedy.